Home » Blog » Is it possible to return to school and balance work? Earning a master’s of science in analytics can represent a huge leap forward for your career. Training in this field readies graduates to gather and interpret large quantities of data, driving strategic decision-making in an organization. In the hands of an expert, the complex information today’s companies gather each day from sources like e-commerce websites and social media become powerful intelligence. However, preparing for a career in the field requires a significant investment of time and effort. Many people are interested in pursuing a business analytics master’s degree but are not certain if they can manage attending school while continuing to work. If you’re wondering how to strike that balance, here are some tips and strategies that will make your education more manageable. Successfully furthering your education starts with knowing precisely what you hope to gain from the experience. Begin working on your degree with a timetable for completion and a strong understanding of how the degree will bring you closer to achieving your long-term goals. Research carefully and plan ahead so you can focus your education on gaining the knowledge that will carry you through the next steps in your career. What do you hope to accomplish in your career over the next several years? How will a graduate degree provide you with the additional qualifications you need to make a change in your role? How will the specific skills you learn in graduate school allow you to contribute at a higher level to an organization and reach your ambitions? How can the professors and peers assist you in moving forward on your career path? How soon can you realistically expect to graduate? What grades do you need to earn? Are there required courses that you expect to be particularly challenging for you? When you lay out precisely what you expect to get out of graduate school and the challenges you’ll likely encounter along the way, you can make wise decisions. It takes plenty of energy and motivation to excel at the graduate level. That’s especially true when you have to stay on top of daily responsibilities from your job at the same time. Clearly defining the outcomes you’re looking for in your schooling and your future at work will help you make your way through the challenges ahead. To reach your goals while meeting the demands of your job, you need to put a great deal of thought into how you schedule your time. Figure out how much schoolwork you can handle in a week and arrange your courses accordingly. Set yourself up for success by maintaining a detailed agenda and knowing exactly when you’ll be able to set aside some time each day for studying or meeting with a group. Try experimenting with a few different arrangements to discover what works best for you, like going to bed earlier and getting up in the morning to spend an hour or two on schoolwork. Both in the office and the classroom, you can make life easier by breaking down projects into manageable chunks. Get started on major assignments as early as possible so you don’t find yourself overwhelmed by multiple deadlines. Talk with your professor about your plans to ensure you fully understand the project and don’t miss anything. One of the most important elements of successfully managing your time is resisting the urge to procrastinate. Self-discipline is essential for anyone taking on both full-time work and graduate school, so take action to keep yourself focused. 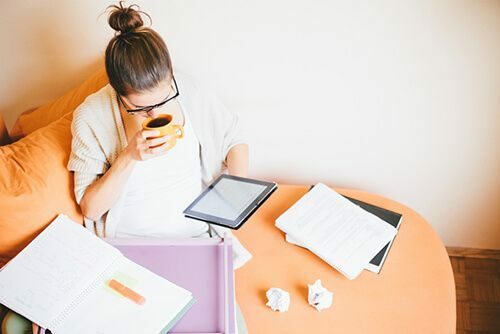 Realistically assess your work habits and find ways to cut down on wasted time, like setting up a designated study area and eliminating distractions, whether in your environment or online. Your employer may be able to offer support in a variety of ways as you further your education. Some companies provide tuition reimbursement, especially if employees can demonstrate the benefits to the organization of having a worker with an advanced degree in data analytics. Whether you’re receiving financial backing from your company or not, keeping the lines of communication open with your manager will make it possible to ask for adjustments to your duties when necessary. Many workplaces allow significant flexibility in the schedules of workers who are attending school, so ask about accommodations. Consider what times of the semester are likely to be packed with high-pressure demands, such as midterm or final exams, so you can request vacation time well in advance. In certain cases, you may even be able to take a leave of absence to complete your education. It’s not possible to give both work and school your full attention at all times of the day. Feeling driven to excel at both is an asset, but you should consider turning down an additional responsibility on occasion or setting a less urgent task aside for a later day. Consider the short- and long-term impact of each item on your agenda, ranking your obligations. Know what projects need your attention right now and which can wait until tomorrow or next week. Plan strategically for the weeks ahead, and seek help from an professor, manager or peer when necessary. Having several pressing tasks to complete on a tight schedule doesn’t leave you much leeway for activities you may enjoy. Unfortunately, that might mean skipping some fun events and putting your hobbies on hold, especially when there’s a big test coming up or a tough assignment to complete. However, maintaining your priorities don’t mean you should neglect your own well-being in the process. It’s vital to strike a balance between work and education, but you must leave some room for a personal life as well. You won’t fulfill your potential in either your career or your education if you let your health and happiness suffer. Allow yourself sufficient time to rest, eat nutritious meals and spend enjoyable time with friends and family. That can be challenging when you have so many demands on the hours of your day, but you can’t meet your responsibilities if you’re too exhausted and stressed to focus. Setting aside some opportunities to reward yourself for a job well done will ultimately benefit your overall performance. Take an evening to enjoy a nice dinner or spend an afternoon at a ballgame. Talking about your struggles and strain also helps to relieve stress. Communicate with loved ones so they understand what you have on your plate, and reach out to fellow students who are taking on the same balancing act to find support. You may be able to trade tips on making the most of both class and work, hold each other accountable for completing the latest homework assignment, or just blow off some steam. For students striving to balance their academic goals with their jobs, online degree programs are often the best way to fit in everything. It’s much easier to plan your schedule when you don’t need to visit campus on a regular basis. You can attend lectures, complete homework and meet with other students from your home or anywhere with an internet connection. When you take classes online, you get the same curriculum as you would by going to a physical classroom. You can even still take advantage of opportunities to expand your professional contacts, thanks to conferencing software and networking events. In fact, online courses are an excellent chance to get to know a wide variety of determined, ambitious professionals in different fields. The Villanova Online Master’s of Science in Analytics offers students a thorough grounding in the principles and practices behind today’s business strategies. The comprehensive curriculum prepares graduates to work in data management, gathering business intelligence and applying predictive and prescriptive models. Visit the program page to learn more about how you can develop the skills today’s businesses demand with the flexibility and convenience to balance your education with work.